The great lesson of global climate change is that everything is connected. The emissions from a coal plant in Iowa, for example, may produce floods in Bangladesh. Or the folks in Iowa may someday suffer bigger floods because of all those new cars about to populate the streets of India. But if the world is connected, you wouldn’t know it by watching the political process in Washington. It is the Capitol of Compartmentalization, the City of Stovepipes and the Land of a Thousand Fiefdoms. Every topic seems to have its own congressional committee, its own federal agency and its own legislation. The stovepipes are especially evident right now as Congress moves toward its August recess and President Obama tries to accomplish as much as he can before his honeymoon is over. We are in the Summer of Big Issues before the new congressional and presidential election cycles initiate another long drought on political courage. For example, in separate legislation, committees, hearings and processes, Congress is considering a climate change bill, a health care bill and an energy bill. It just finished work on a military spending bill and will soon begin work on a major transportation bill. Leaders are trying to prevent gridlock in this traffic jam of separate issues competing for their time and attention, each important in its own right with its constituents begging for action. Trouble is, all of these issues are connected. In a rational world, they could not and would not be considered in isolation from one another. There is no more obvious example than Appalachia where the adverse impacts of outdated energy policy have impacts from every home to every nation. In Appalachia, we see global climate change at its roots while national energy policy sabotages public health and environmental quality for the people living there. It’s easy for the rest of us to ignore what’s happening in Appalachia – until we realize how connected we really are with the region. 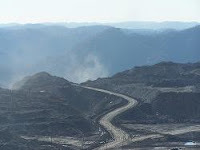 Every mountaintop that’s blown up is connected to every fetus poisoned by mercury pollution from coal-fired power plants, every child who suffers from asthma related to air pollution, and every family victimized by fire, flood or disease attributed to global warming. Our continuing reliance on coal has an effect on national defense, too. We have just been warned by a group of retired admirals and generals that our use of fossil energy, in whatever form and from whatever source, is a threat to national security and military effectiveness. (Go here to see newly released video interviews with the flag officers who issued this warning.) Energy policies that continue subsidizing or promoting fossil energy consumption produce a less safe nation, driving up defense spending, which in turn takes resources from other public needs. health impacts from heat waves and severe storms, ailments caused or exacerbated by air pollution and airborne allergens and many climate-sensitive infectious diseases. Heat already is the leading cause of weather-related deaths in the United States, according to the report, and climate change will bring more. Chicago could see heat-related deaths quadruple under a high-emissions scenario; deaths in Los Angeles could be five to seven times higher than they were in the 1990s. Warmer weather, meanwhile, contributes to poor air quality, a problem that already threatens the health of half of all Americans – some 158 million people. The transportation stovepipe, meanwhile, is connected to the climate, energy, health and national security stovepipes. Vehicles are a major source of unhealthy air pollutants as well as greenhouse gases. Cities designed to promote safe walking and biking can reduce childhood obesity and produce healthier citizens. So, if we’re really concerned about controlling health care costs, the top priority of national transportation policy should be mass transit and walkable communities, not highways. In other words, you can’t accurately talk about global climate change or national energy policy or national transportation policy without talking about the rising costs of health care or national security. But in Congress, they do. Trying to describe all of this connectedness is like trying to track the synapses in the brain. All of those polls that ask us to pick our highest priorities force false choices by making us decide between the economy, health care, national security and climate change. In realty, they’re conjoined issues. We must become a holistic worriers. I don’t know how to change Stovepipe City into a place that recognizes the web of life or the warp and woof of the socioeconomic fabric, or that stops making whack-a-mole public policies that pound down one problem in ways that make others pop up. How do we change the fact that the Law of Unattended Consequences so often makes the Law of Unintended Consequences the supreme law of the land? Should Congress meet each day as a Committee of the Whole? Should President Obama create a Department of Connections? More seriously, it wouldn’t hurt if Congress required each new piece of legislation to carry a whole-cost analysis, assessing net impacts on energy, water, climate, public health, national security, the economy, and ecosystem services.. The President could require the same analysis from each agency when it submits its annual budget request. The calculations may not be as complicated as they seem. Bob Costanza and his colleagues at the University of Vermont are among several experts working on full-cost calculators to support policy-making at the federal and local levels. What we can’t do is continue assuming that because an issue has its own congressional committee, its own budget and its own lobbyists, it can be addressed in a stovepipe. Government may be organized that way, but the universe is not. Ask the good people of Appalachia.